When a vehicle leaves the traveled way and encounters a pavement-shoulder drop-off, it can be difficult for the driver to return safely to the roadway. As the driver attempts to steer back onto the pavement, the side of the tire may scrub along the drop-off, resisting the driver's attempts. This resistance often leads the driver to overcorrect with more steering input. When the tire finally remounts the pavement, the larger steering angle may cause the vehicle to "slingshot" across the road. This can result in a head-on collision with other traffic or a loss of control and overturning of the vehicle on the roadway or roadside. The safety edge is an innovative treatment intended to minimize drop-off-related crashes. With this treatment, the pavement edge is sloped at a 30 degree angle (see figure 1). This angle makes it easier for a driver to safely reenter the roadway after inadvertently driving onto the shoulder. Figure 1. Safety edge detail. Research conducted by Texas Transportation Institute (TTI) in the 1980s found that drivers rated a 45-degree wedge as a much safer pavement edge to remount than either the vertical or rounded edges normally found with portland cement concrete and asphalt pavements. (1) Because drivers in the study were instructed to drive off the pavement edge, the TTI research has been criticized as not being representative of naïve drivers. Prior to this research, neither an actual field evaluation of the safety edge nor a formal effectiveness evaluation had been completed. Treatment sites: sites that were resurfaced and treated with the safety edge. Comparison sites: sites that were resurfaced but not treated with the safety edge. Reference sites: sites that were similar to the treatment and comparison sites but were not resurfaced. Rural multilane roadways with paved shoulders with widths of 4 ft or less. Rural two-lane roadways with paved shoulders with widths of 4 ft or less. Rural two-lane roadways with no paved shoulders (i.e., unpaved shoulders only). Reference sites in each participating State included sites that had not been resurfaced during the study period before resurfacing of the treatment and comparison sites and were not expected to be resurfaced during the entire 3-year study period. The reference sites were used to develop safety performance functions (SPFs) for an observational before-after empirical Bayes (EB) evaluation. The reference sites included the same roadway types as the treatment and comparison sites. Reference sites were chosen from the same highway districts as the treatment sites in the same geographical area of the State. Each resurfacing project was divided into smaller roadway segments so that each site was relatively homogenous with respect to lane width, shoulder type and width, and traffic volume. The project database included 415 sites: 261 in Georgia, 148 in Indiana, and 6 in New York. The individual sites ranged in length from 0.1 to 25.8 mi. The total length of all segments considered in the study was 685 mi in Georgia, 514 mi in Indiana, and 25 mi in New York. The New York sites and the multilane sites in Georgia and Indiana are discussed in the project's final report but are not discussed in this summary. (2) Table 1 provides descriptive statistics of the two-lane sites in Georgia and Indiana. Figure 2 and figure 3 show examples of typical study sites. Table 1. Summary of traffic volume and crash data for two-lane roadways with paved and unpaved shoulders in Georgia and Indiana. 1 Does not include at-intersection or intersection-related crashes. NOTES: Georgia study periods were from 1999 to 2004 (before) and from 2006 to 2008 (after). Indiana study periods were from 2003 to 2004 (before) and from 2006 to 2008 (after). Treatment sites were resurfaced with safety edge, comparison sites were resurfaced without safety edge, and reference sites were not resurfaced. Figure 2. Georgia treatment site. Figure 3. Indiana treatment site. A key objective of the evaluation was to determine the effectiveness of the safety edge treatment while avoiding any potentially confounding safety effect due to pavement resurfacing. This was critical because the safety edge treatment is always implemented in conjunction with a resurfacing project. Previous research indicated that pavement resurfacing by itself may have a short-term negative effect on safety, increasing crashes because of increased speeds. One study found this effect to be statistically significant and to persist for 12 to 30 months after resurfacing. (3) However, a more recent, larger study in National Cooperative Highway Research Program (NCHRP) Project 17-9(2) found inconsistent results. (4) Increases in crash frequency with resurfacing were found in some States, but decreases in crash frequency with resurfacing were found in others. Therefore, the safety effects of the pavement resurfacing and the safety effects of the safety edge treatment may be confounded, at least for some period of time. The study design was developed to estimate the safety effect of the safety edge treatment despite the effect of pavement resurfacing. First, the study period after resurfacing was set at 3 years. This is long enough to extend beyond the duration of any short-term resurfacing effect. Second, resurfaced sites both with (treatment sites) and without (comparison sites) the safety edge treatment were considered. The ratio of safety between resurfaced sites with and without the safety edge treatment represents an effect of the safety edge treatment as long as the sites can be assumed comparable in all other respects. The evaluation approach was an observational before-after comparison using the EB technique, as formulated by Hauer. (5, 6) The specific version of the EB technique used in this evaluation was developed for the FHWA SafetyAnalyst software tools. (7) The primary objective of the before-after evaluation is to compare the actual observed number of crashes after the treatment is implemented to a calculated expected number of crashes in the after period had the treatment not been implemented. This comparison provides an estimate of the overall safety effectiveness of the treatment expressed as a percent change in crash frequency. The EB before-after observational evaluation procedure was programmed and executed in the SAS® software package and applied to the crash data before and after resurfacing with the safety edge treatment. (7) Safety effectiveness estimates and precision estimates (standard error), along with statistical significance, are presented in table 2. Table 2. Before-after EB evaluation results for two-lane roadways with paved and unpaved shoulders in Georgia and Indiana. T = Treatment sites resurfaced with safety edge. C = Comparison sites resurfaced without safety edge. No = Not statistically significant at 10 percent significance level. The safety edge effect shown in table 2 is the ratio between the before-to-after change in crash frequency for the treatment sites and the before-to-after change in crash frequency for the comparison sites. This formulation of the safety effect was derived from the multiplicative nature of crash modification factors (CMFs), as shown in equation 1 and equation 2. The before–to–after percent change in crash frequency can be converted to a CMF for this calculation by dividing by 100 and adding a value of one. Similarly, the final CMF for the safety edge can be converted back to a percent change by subtracting the ratio from one and multiplying by 100. When the increase in crashes with resurfacing was greater at the comparison sites than at the treatment sites, an indication that the safety edge treatment was effective, the safety edge effect is shown in the table as a positive value. The standard error of the safety edge effect is presented as a measure of its precision, along with an indication of its statistical significance. 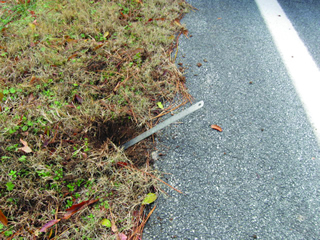 The results in table 2 indicate that for all two–lane paved– and unpaved– shoulder sites in Georgia and Indiana, the safety edge effect was 5.7 percent for total crashes. This result was not statistically significant. Similar analyses found safety effectiveness estimates for the safety edge treatment of 6.3 percent for run–off–road crashes and 5.6 percent for drop–off–related crashes. (2) The results for run–off–road and drop–off–related crashes were also not statistically significant. They vary more in sign and magnitude than the results for total crashes and generally appear less stable. Therefore, the 5.7 percent effectiveness estimate for reduction in total crashes appears to be the most reliable effectiveness estimate for the safety edge treatment. Contract costs of resurfacing for both treatment and comparison sites were reviewed. Collectively, the cost of resurfacing with the safety edge treatment was found to be slightly less than without the safety edge treatment. The cost of resurfacing was found to be $96,000 per mi with the safety edge treatment and $110,000 per mi without the safety edge treatment. This difference is small enough that it could be due to project factors other than the safety edge treatment. Some advocates of the safety edge treatment maintain that incorporating it in resurfacing projects has little, if any, added cost because the asphalt is merely reformed to create the safety edge. The previous comparison could be interpreted as consistent with this hypothesis. However, construction practices vary between contractors and highway agencies, and while the amount of additional asphalt used for the safety edge treatment may be very small, it is unrealistic to assume that there is no additional cost to implement the treatment. Consequently, an alternative approach to estimating the cost per mile was developed. The alternative approach to determining the additional cost of the safety edge treatment was to compute the amount of asphalt used to provide the treatment and multiply this quantity by a typical bid cost per ton of hot–mix asphalt for a specific project. Using this method, the cost for a safety edge treatment 1.5 inches high would be $536 per mi. The cost for a safety edge treatment 3.0 inches high would be $2,145 per mi. Thus, a reasonable range of costs for the safety edge treatment is $536–$2,145 per mi. A benefit–cost analysis of the safety edge treatment based on the safety and cost results was conducted by calculating a benefit–cost ratio. The benefit–cost ratio for the safety edge treatment was determined using equation 3. NFI = number of fatal and injury crashes per mile per year before application of the safety edge treatment. NPDO = number of property–damage–only crashes per mile per year before application of the safety edge treatment. ESE = effectiveness (percentage reduction in crashes) for application of the safety edge treatment (5.7 percent reduction). CFI = cost savings per crash for fatal and injury crashes reduced. CPDO = cost savings per crash for property–damage–only crashes reduced. (P/A, i, n) = uniform series present worth factor. i = minimum attractive rate of return (discount rate) (expressed as a proportion; i.e., i = 0.04 for a discount rate of 4 percent). n = service life of safety edge treatment (7 years). CCSE = cost for application of the safety edge treatment (in the range of $536–$2,145 per mi for both sides of the road combined). Incapacitating (A) injury crash, $402,000. Nonincapacitating (B) injury crash, $80,000. Possible (C) injury crash, $42,000. The weighted average cost of a fatal or injury crash, assuming 1 percent fatal crashes, 9 percent A–injury crashes, 50 percent B–injury crashes, and 40 percent C–injury crashes, is $150,980 per crash. For each state and roadway type, benefit–cost analyses were performed for average annual daily traffic (AADT) volumes ranging from 1,000 to 20,000 vehicles per day. For two–lane highways with paved shoulders, application of the safety edge treatment had minimum benefit–cost ratios ranging from 3.8 to 43.6 for Georgia conditions and from 3.9 to 30.6 for Indiana conditions. 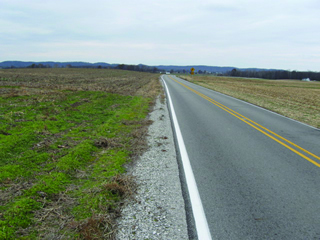 For two–lane highways with unpaved shoulders, the minimum benefit–cost ratios for the safety edge treatment ranged from 3.7 to 62.8 for Georgia conditions and from 2.8 to 12.8 for Indiana conditions. The overall results of the minimum benefit–cost analysis are illustrated in figure 4. The maximum benefit–cost ratios are four times the minimum benefit–cost ratios, as illustrated in figure 5. Figure 4. AADT versus minimum benefit-cost ratio. Figure 5. AADT vs. maximum benefit-cost ratio. These results suggest that the safety edge treatment is highly cost–effective under a broad range of conditions. Even though there is some uncertainty in the treatment effectiveness estimate, the safety edge treatment is likely to be a good safety investment in most situations and is especially so for roadways with higher volumes, where higher crash frequencies are expected. The results of the EB evaluation indicate that for all two–lane highway sites in two States the best estimate of the effectiveness of the safety edge treatment is a reduction in total crashes of approximately 5.7 percent. While this result was not statistically significant, the results obtained for total crashes were nearly always in a positive direction. The results of evaluations for fatal and injury crashes were too variable to draw conclusions. The cost of adding the safety edge treatment to a resurfacing project is minimal. Overall project costs and the overall cost of asphalt resurfacing material did not increase for resurfacing projects with the safety edge compared to resurfacing projects without the safety edge. However, computations based on the volume of asphalt required to form the safety edge suggest that the cost of the safety edge treatment is approximately $536–$2,145 per mi for application to both sides of the roadway. Benefit–cost analysis based on the estimated 5.7 percent crash reduction effectiveness of the safety edge treatment found that this treatment is so inexpensive that it is highly cost–effective for application in a broad range of conditions on two–lane highways. Computed minimum values for benefit–cost ratios ranged from 4 to 44 for two–lane highways with paved shoulders and from 4 to 63 for two–lane highways with unpaved shoulders. The benefit–cost ratios are generally higher with a higher traffic volume and where the cost of installing the safety edge treatment is lower. The safety edge treatment is suitable for use by highway agencies under a broad range of conditions on two–lane highways. While the evaluation results for total crashes were not statistically significant, there is no indication that the effect of the safety edge treatment on total crashes is other than positive. That the overall effectiveness of the safety edge treatment was not statistically significant is not surprising given that the magnitude of that safety effect appears to be quite small (approximately 5.7 percent). However, the safety edge treatment is so inexpensive that its application under most conditions appears to be highly cost–effective. The cost–effectiveness of the safety edge treatment increases with increasing traffic volumes. The effect of the safety edge treatment would be cost–effective for two–lane highways with traffic volumes over 1,000 vehicles per day even if its effectiveness were 2 percent rather than 5.7 percent. For roads with higher traffic volumes, the safety edge treatment is highly cost–effective. Zimmer, R.A., and Ivey, D.L. (1983). "Pavement Edges and Vehicle Stability—A Basis for Maintenance Guidelines," Transportation Research Record 946, 48–56, Transportation Research Board, Washington, DC. Graham, J. L., Richard, K.R., O'Laughlin, M. K, and Harwood, D.W. (2011). Safety Evaluation of the Safety Edge Treatment, Report No. FHWA-HRT-11-024, Federal Highway Administration, McLean, VA.
Hauer, E., Terry, D., and Griffith, M.S. (1994). "Effect of Resurfacing on Safety of Two-Lane Rural Roads in New York State," Transportation Research Record 1467, 30–37, Transportation Research Board, Washington, DC. Hughes, W.E., Prothe, L.M., and McGee, H.W. (2001). "Impacts of Resurfacing Projects With and Without Additional Safety Improvements," NCHRP Research Results Digest 255, Transportation Research Board, Washington, DC. Hauer, E. (1997). Observational Before-After Studies in Road Safety, Pergamon/Elsevier Science, Inc., Tarrytown, NY. Hauer, E., Harwood, D.W., Council, F.M., and Griffith, M.S. (2002). "Estimating Safety by the Empirical Bayes Method: A Tutorial," Transportation Research Record 1784, 126–131, Transportation Research Board, Washington, DC. Harwood, D.W., Torbic, D.J., Richard, K.R., and Meyer, M.M. (2010). SafetyAnalyst: Software Tools for Safety Management of Specific Highway Sites , Report No. FHWA-HRT-10-063, Federal Highway Administration, McLean, VA.
SAS Institute, Inc. (2008). SAS/STAT® 9.2 User's Guide, Cary, NC. This research was conducted by Jerry Graham, Karen Richard, Mitchell O'Laughlin, and Doug Harwood of the Midwest Research Institute. The full final report by the same name can be downloaded from the FHWA Safety Research and Development publications Web site at https://www.fhwa.dot.gov/research/tfhrc/offices/safety/. For more information about HSIS, contact Carol Tan, HSIS program manager, HRDS, 202-493-3315, carol.tan@dot.gov.